Purchased on the Fellows Fund, special gift of Mrs. Roy O'Connor, 1984. Florence, John Edward L. Murray; Milan, Ulrico Hoepli, Apr. 7-9, 1927, lot 324; Jakob Hirsch, Geneva; Herbert Straus, Therese K. Straus. 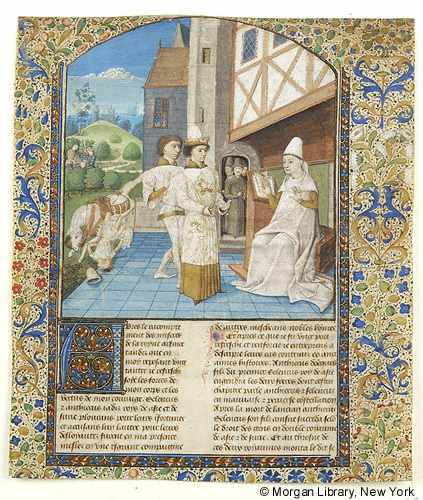 Ms. leaf cut from a French translation of De casibus virorum illustrium from the Latin of Laurent de Premierfait that was written and illuminated in the Loire River Valley, France, ca. 1470-1480. Decoration: 1 large miniature, 1 full illuminated border, illuminated initial, 3 filigree initials. Artist: a follower of the Coëtivy Master.